Minister Ze'ev Elkin says Israel must not cancel the security measures on the Temple Mount, despite pressure to do so. Minister Ze'ev Elkin (Likud), a member of the Political-Security Cabinet, said on Wednesday that Israel must not cave in to pressure and cancel the security measures on the Temple Mount. "When we take action for security reasons, we cannot fold under pressure. 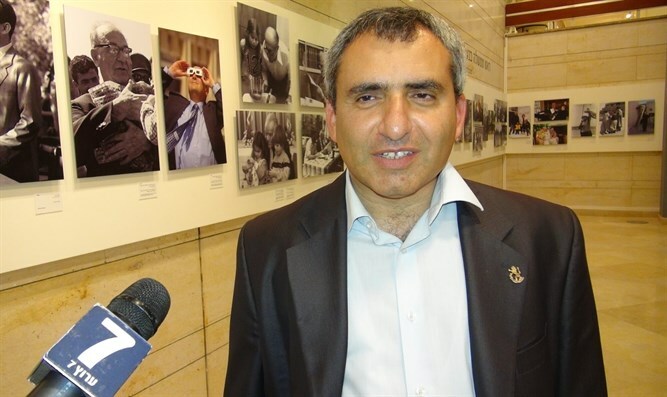 When I hear rumblings that this is something humiliating and therefore the Jewish and Arab residents of Jerusalem do not want to go through the magnetometers, I cannot believe it,” Elkin told Arutz Sheva. "I visit hospitals in Jerusalem and see the Muslim Arab population there and they are not humiliated by security measures at the entrance to hospitals, malls, or the National Insurance Institute when they go to receive an allowance. So the security measures at the entrance to the Western Wall are humiliating? It's obvious that there's a campaign of incitement here after there was such a terrible attack at the Temple Mount. It is clear that the security operations must be tightened,” he added. Following last Friday's terrorist attack at the Temple Mount, Israel announced a series of security measures, including the placing of magnetometers (advanced metal detectors which are selective in which metals they react to) and additional security cameras around the entrances to the holy site. The new security measures prompted an outcry from the Palestinian Authority, the Jordanian Waqf and the Jordanian government, which demanded a return to the status quo. Earlier on Wednesday, Education Minister Naftali Bennett said that the Arab world is fighting Prime Minister Binyamin Netanyahu to back down from the security measures, and said that Israel must not back down. "There is heavy pressure on the Prime Minister from all over the Arab world to back down over security on the Temple Mount. We are now in the process of placing magnetometers to restore security. We must not back down. Two policemen were murdered by terrorists on the Temple Mount. We are in the midst of a test of our resilience and we must not back down, and we must restore security to the Temple Mount,” Bennett stressed.